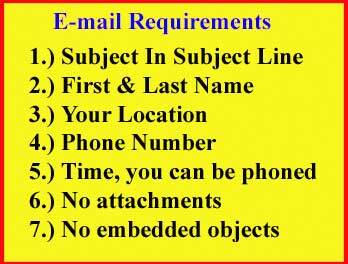 All Punch Bits shown on this page will fit in the Horotec Tools as well as Bergeon Tools. These punches and screwdrivers will also work in the 180-India Press and would be a way to upgrade that tool quite a bit! Also know as Bergeon Accessories for the Minathor, Wenger Knife. In Stainless Steel. The Minathor tool holder 1550-0 is the exact same thing as the Bergeon pin holder 6744-PG. Same tool with different part numbers. Can be use as an extra pin holder to drive out pins. 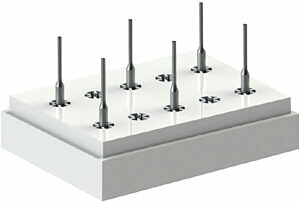 Set of six Bergeon punches number 6745-G (sizes: .40, .60, .80, 1.00, 1.50 & 1.80 mm) on a plastic block. These punches also work with the Minathor Knife, by Wenger. Includes 10 Screwdriver Blades. 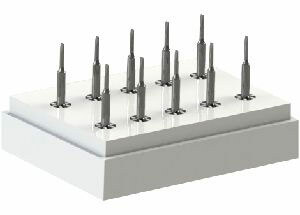 5 standard heads number 6745-M (sizes: .80 x 2pcs, 1.0 x 2pcs, 1.2 x 2pcs, 1.5 and 2.0 mm), also 2 phillips number 6745-MC (sizes: 1.5 and 2.0 mm) on a plastic block. These blades also work with the Minathor Knife, by Wenger. Bergeon pin punch bits are made in hardened stainless steel.